Based on xkcd: Hoverboard, SKATEBOARD is an online multiplayer game that brings you an infinitely big world to explore! 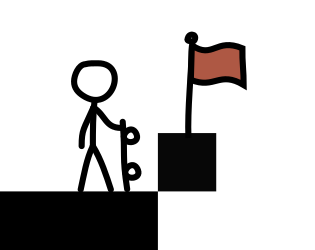 The game was originally made in a weekend during the xkcd Game Jam and updated in 2019/01/16. Skateboard is an online game with a huge world to explore. You'll be able to see other players, both those who are playing and those who left. You start with 3 geocaches, which you can leave or retrieve anywhere, at any moment. Your mission is to leave as many geocaches as possibles in the world, BUT beware: players who find your geocaches will be able to take them and use them for their own benefit! Try not to leave them all in the same place, and try to hide them in difficult to reach places! And, of course, try to find other players' geocaches! You have a flag you can use to ease your exploring. Simply drop it anywhere and you'll be able to return to its position in an instant. You have a compass that helps you to find geocaches in the map! Want to see how the rest of the players are doing? Check the game leaderboard and stats! Move, jump and double-jump with WASD or the arrows. Run with Shift (left or right). Put geocaches with L and pick them with J. Put your checkpoint flag with P and teleport to it with I. The controls are made so you can control your character with your left of right hand. Still, you can change them in the desktop version of the game. Use your checkpoint flag! It'll help you a lot when climbing! You can fall through floating platforms by keeping pressed Down/S and then pressing Up/W. Running before jumping will help you to reach far platforms. The information that appears when you press Esc will help you to navigate. Check the compass to see where are the closest geocaches! Game and art by Racso. Both things are obviously inspired by Randall Munroe's work in xkcd.